In space, the demons can hear you scream. Space travel has always come with risks. But hyperspace travel comes with one particularly frightening hazard, namely, the non-corporeal dark energy-based macrobiotic entities that inhabit the void and are insensibly drawn to the presence of human minds. Once penetrated by a macrobe, the infected human mind rapidly devolves into raving insanity, which usually presents in a homicidal manner. Fortunately, hyperspace-capable ships are protected by a dark energy resonator that keeps the macrobes away and thereby permits safe interstellar travel. But what happens when a ship’s resonator is sabotaged while it is traveling through hyperspace? And who would be so insane as to unleash a demonic infection of mutating madness on an entire ship’s crew? Jonathan Moeller is one of the most prolific self-published authors of science fiction and fantasy today. He is the author of THE GHOSTS, DEMONSOULED, FROSTBORN, THE TOWER OF ENDLESS WORLDS, and THE THIRD SOUL series of fantasy novels. 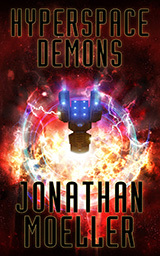 “Hyperspace Demons” is his first publication with Castalia House. EPUB and MOBI (for Kindle) format. No DRM. 60 pages.